Alaska’s 2015-2016 winter was the second warmest on record, dating back to 1925. And here on Kodiak Island, it’s been one of the rainiest. So when the clouds parted a few days ago, I took my camera for a walk along an ocean bluff, edged with spruce trees, in search of spring wildflowers and fresh greenery. It was early for wild orchids (I promise to post later), but I came upon clumps of graceful fiddlehead ferns. I crouched down onto my belly, grateful for the mattress of moss, to study the tall stems that hadn’t completely unfurled. A similarity between blood and chlorophyll. Really? How similar are we, humans and plants? It is definitely food for thought, to behold the Oneness in all. Meanwhile, I’m celebrating spring in new ways and looking forward to more discoveries along my inner Journey. Your photos definitely make one think of moving to Alaska, but I think I’ll stay in Oregon. Saw a Japanese cooking show the other day where she battered and fried fiddleheads. I’ve not had them cooked that way or on pizza. Would be worth trying! M.
Funny I should read your fiddlehead comment today… this afternoon we visited friends who live off the grid an hour’s boat ride away; we feasted on picked beets, homemade sausage, smoked salmon and pickled fiddleheads. What a treat! Marion, you did “humanize” the fern. A little unsettling but they are so tasty…Enjoyed your thoughts and photos as usual. 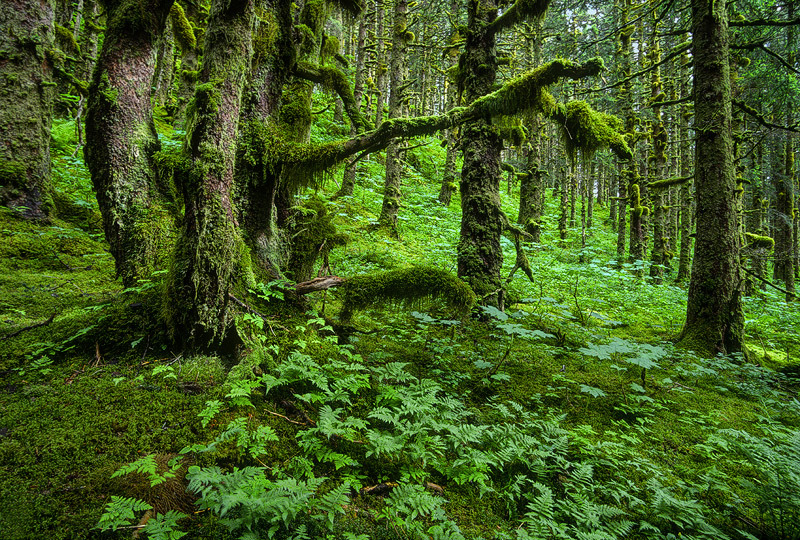 Miss the Kodiak forest. It is so beautiful and unique. Enjoy the spring. Thanks, Candy… You miss the spruce forests… I bet you miss the green and freshness they provide. I hope your spring is lovely, though. Big hugs. Nice try, Marion, I’m still going to eat a few fiddleheads before they unfurl! I only clip a couple from the bunch that pop up from each root stalk every spring. There will always be some to hug and some to keep the clan well-fed for next year. Fiddleheads are somewhat poisonous (that’s what I tell all my friends) until they are par-boiled for about five minutes and drained very well. Then they are sauteed with coarsely-sliced thick bacon dices until just barely tender, about the same time as when the bacon is almost crisp. A couple of grinds of Tellicherry black pepper, pink Himalayan salt, and a few scratches of fresh nutmeg and you will have a spring treat that tastes like you just got hugged! A yummy recipe. And yes, I do enjoy eating fiddleheads. On pizza, too. Lovely photos and thoughts, Marion. A good reminder to sit quietly and see what miracles are around us rather than be preoccupied by the thoughts whirling around in our heads. Give my best to the fern(s). You are so right, Diana. And it seems we have to work harder to be still, with all the media and other distractions around us. Hugs to Jack and Bob. Thanks, Eva. The hug was, well, rather unexpected. I was there, taking photos, pretty much working out of my head, if you know what I mean. So it was a sweet surprise. Also a heads-up reminder to wake up and smell the roses (get hugged by a fern). As usual, an in sight full post, thought provoking and interesting . Always save your post to read last, like dessert! Thank you Velda. There’s a saying, “The beauty of roses bypasses not the wisdom of ferns.” Enjoy your day!